Ok, so you might think the title to this review is a little confusing and I completely understand why. During my research for the perfect memory foam mattress for me, I was where you are now. How can something be firm yet soft? Well, it’s true it can but in the following few words you are first going to find out what the positives and negatives are to this. The model of foam mattress I have chosen to demonstrate is the Signature Sleep memory foam mattress, and the manufacturer has decided to design this mattress in several depths – more on that further down below. We will start with the 12-Inch model, and I will try not to “babble” on about how firm or soft this mattress is (well, maybe a little). Let’s see what the other benefits it has to offer. 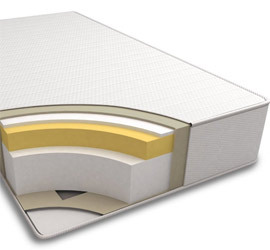 The main reason most people are looking for a memory foam mattress is because they want comfort while they sleep, and this technology is about the best out there. However (as you’ve probably realized) there is an abundance of choice on the market, so why have I decided to include this one on my website? Well, first of all it’s ideal for those of you who have problems with back, shoulder or hip pain, and I’ve seen quite a few comments and examples of people whose aches totally disappeared. In fact, it’s probably the most affordable mattress to help with joint problems. This memory foam mattress comprises of ILD (indentation load deflection) 9 to 4lb memory foam which is why people comment on the firmness. When it comes to being “soft”, this is due to the way in which the mattress surrounds your body when you lie on it. How can something be firm yet soft? Well, the firmness of the Signature Sleep memory foam mattress comes from ILD 9 to 4lb, and the softness comes from the way in which the mattress surrounds your body when you lie on it. Now this is where I get into what might just make you look at another model or, indeed, a different depth. People who are slightly heavier might find this mattress a little too soft because you will sink into it more than someone who is lighter. You might also find this mattress supports you better if you prefer to sleep on your back. For side or front sleepers, it may be a little too firm. Well, the overall effect is a mattress that molds to the shape of your body. This eliminates motion disturbance but at the same time supports various pressure points to help alleviate those nasty aches and pains. So if you’re someone who doesn’t need extremely firm or super soft, it’s hard to go wrong with this mattress. To help keep the cost down, you will receive the Signature Sleep rolled and vacuum packed, so you will need to unpack it and let it expand before you can use it. As the manufacturer recommends you should leave it for a good 48 hours before you use it, but to ensure the mattress is fully expanded and you get rid of the odor that’s sometimes synonymous with this type of mattress I would even leave it for 72 to 96 hours. Heat is something else to consider. This model does not come with any form of cooling technology so if you live in a warm climate or are sensitive to being hot overnight, I would recommend you invest in some cool-touch sheets or mattress protector. It’s worth noting the knit type fabric cover is not removable so you will need to cover it with something anyway for the sake of hygiene. Of course, this model is 12 inches in depth but Signature Sleep know this won’t suit everyone, so rather than send you to another page on my website I thought it would be easier to give you an insight into the other depths available. This model will give you all the benefits mentioned above however, do bear in mind the ILD 9 is to 2lbs which means it’s probably better for people who don’t weigh much. In fact, I think this one would do very well as an option for children or in a guest room. Plus, it won’t take as long to expand, it will be at its maximum depth in just a few hours. But again, you may want to leave it for 24 to 48 hours if you’re sensitive to that “new mattress” smell. Although this one is available in the same sizes at the two mentioned above, I will say (as you probably already know) that a 6 inch mattress will not accommodate those of you who are on the heavier side. For me, I wouldn’t recommend this depth if you weigh more than 180lbs. That said it is a great option for children and people who prefer a good solid (firm) mattress beneath them. The IDL is the same as the 8 inch and if you’re worried about being able to move the mattress, this one is much easier than the others. If you’re on a budget or just want to try a memory foam mattress for the first time I think these are a great option. If you would like to find out more about the price, or you’re just interested to see what others have to say, take a peek at Amazon. For those of you who are interested in the 8 inch model, here it is. The 6 inch mattress can be found here.